Ask Bryan Finocchio and Salvatore Forte how they met, and they both laugh: “I was a Jet, and he was a Shark” in a community theater production of West Side Story, Bryan explains. In a scene that definitely wasn’t scripted, the two college students fell for each other. “It was kind of love at first sight,” he adds. Over the next six years, the pair would move in together, buy a loft in Lynn, and adopt a dog named Duncan. Finally, “it was time to take the leap,” Salvatore says. For their August celebration at the Liberty Hotel, “we did everything a little differently,” Bryan says. Instead of assigning seats, they asked guests to sit wherever they felt comfortable. In lieu of a sit-down meal, they offered stations with gourmet sliders and pasta. And their wedding cake, from Whole Foods, was for cutting purposes only; the real dessert was oversize Munchkins and doughnuts. 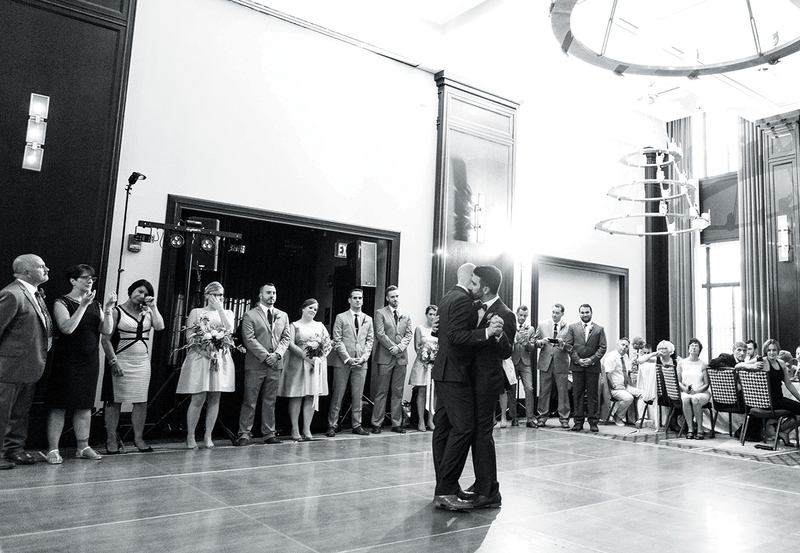 “We didn’t want our wedding to be cookie-cutter,” Bryan says. 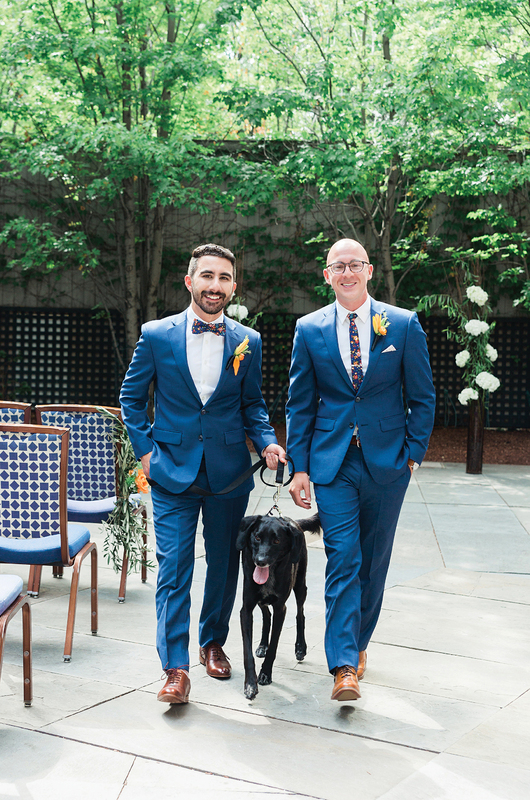 Of course, there’s little chance of that when your ring-bearer is your dog. 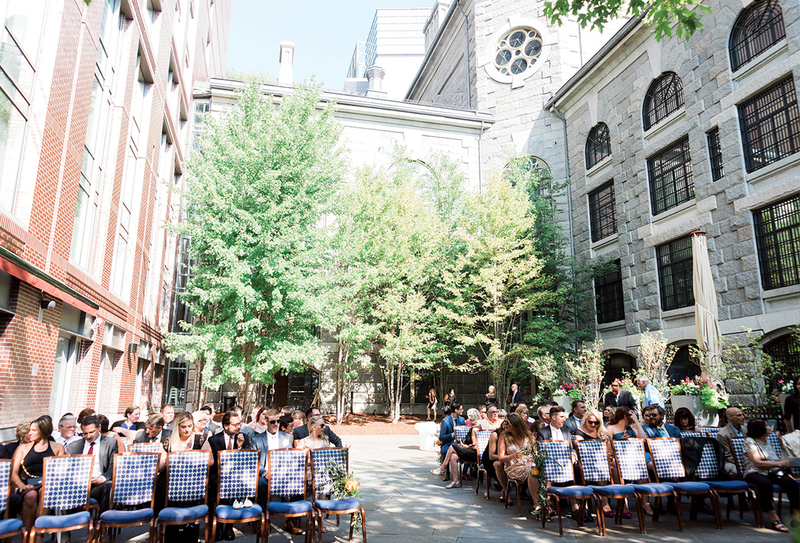 Although it rained on their wedding day, the sun came out long enough to have the ceremony outside in the courtyard. 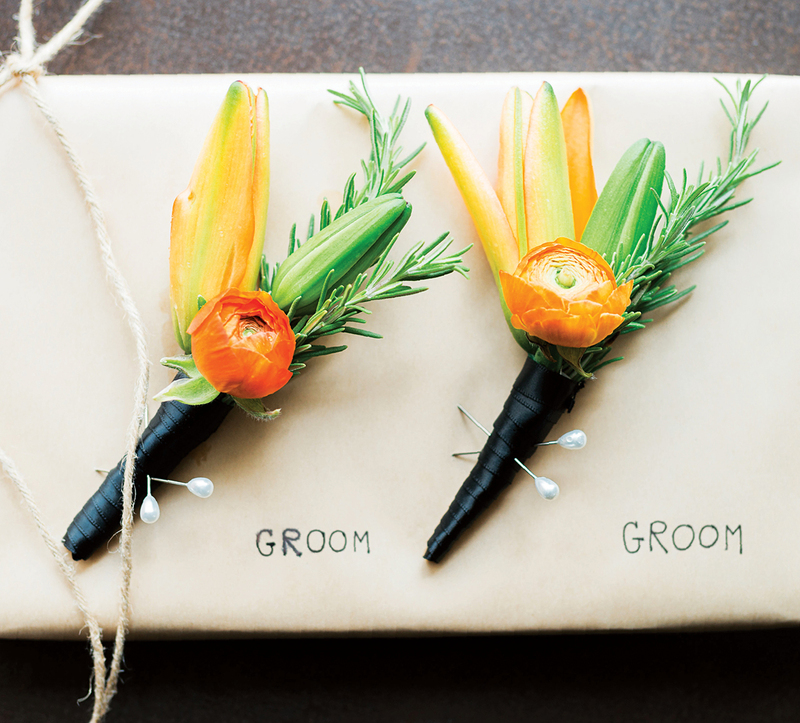 Rosemary accents on the men’s boutonnieres added a touch of green and a fresh, soothing aroma. 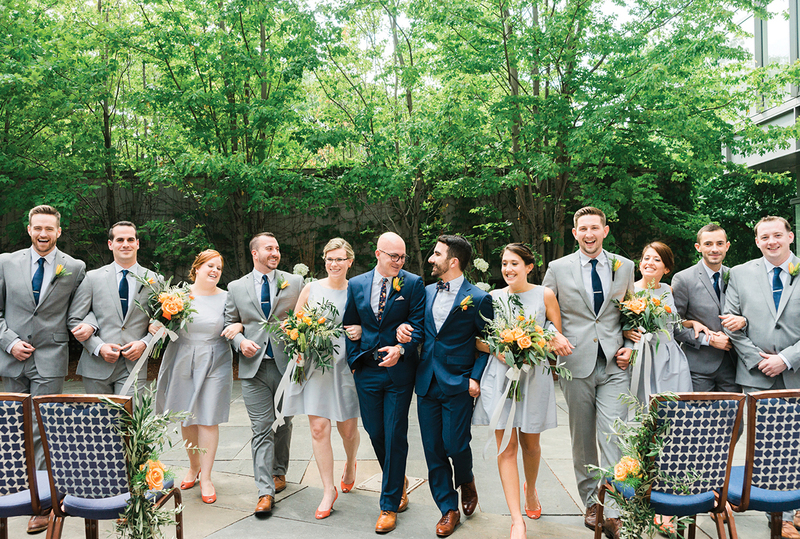 The groomsmen donned light gray suits, while the bridesmaids wore gray A-line Alfred Sung dresses. 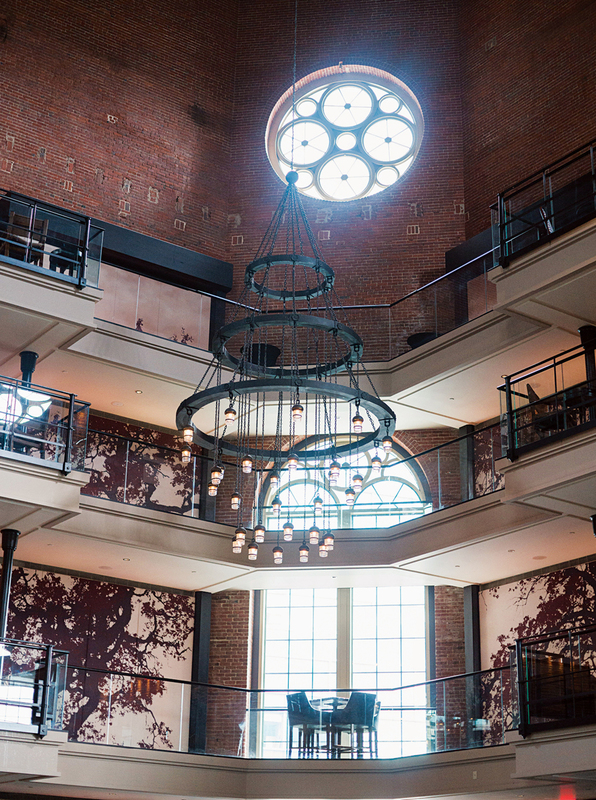 Guests enjoyed cocktails on the fifth floor of the former jail’s soaring 90-foot central atrium. The music was very important to Bryan and Salvatore: They sent the DJ a four-hour playlist as inspiration. “He enhanced it and made it even better,” Salvatore says. 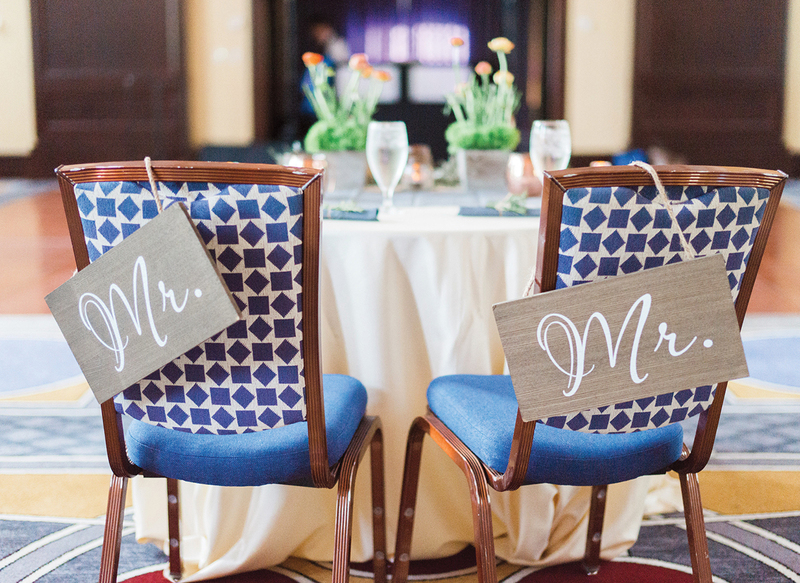 The couple had their own table for the reception, but they rarely sat down, opting to spend most of their time on the dance floor. “I don’t even think we ate dinner,” Bryan says. 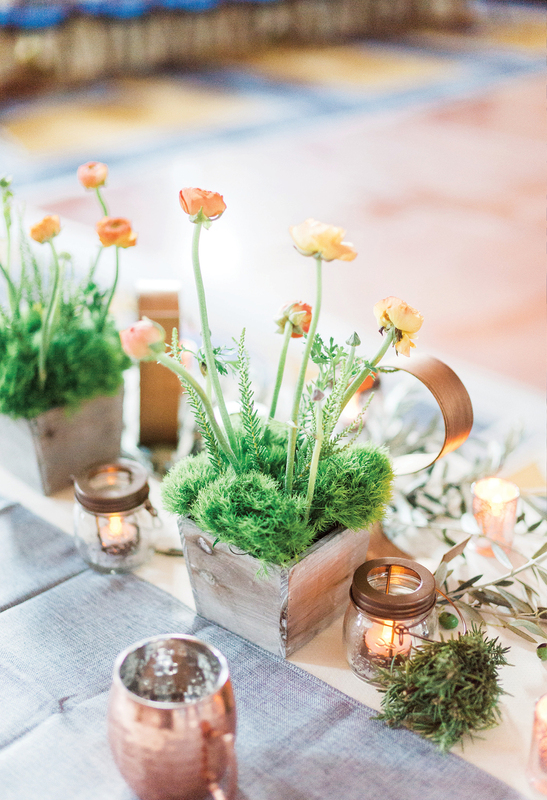 “We both love the city but wanted something that still felt cozy and beautiful,” explains Bryan, who imbued the décor with an “urban garden” feel. Grooms’ Ties General Knot & Co.